As bloggers, we put a lot of effort into telling our readers how to do things. What if they don’t want a teacher to tell them what to do? What if all they’re looking for is a warm and understanding person who understands what they’re going through and is willing to love them, no matter what? Someone like (you guessed it) Mr. Rogers. Do you care how they feel? Being a kid can be tough. Everyone is always telling you to be quiet. No one wants to listen to what you think. Your parents make you go to bed, just when all of the fun is starting. Fred Rogers made you feel like it was just you and him hanging out. He respected what you thought. He loved you, not because he had to (like your parents), but because he genuinely believed you were special. After a while, you believed him. You felt special. You came back to the TV, day after day, just so you could feel that way again. The best bloggers do that too. I read Copyblogger everyday for years before submitting this guest post, and it wasn’t just the information that kept me coming back. It was because, when I was done reading, it made me feel smarter, like I was one of the few people on the web who was truly in the know. The more I think about it, the more I believe that’s a part of our job. Our job as bloggers isn’t just to inform our readers, but to make them feel special. How much do you care about your readers? I mean, really care? Mr. Rogers didn’t just talk to children on television. He also visited them in person. On a regular basis, he would go out into public and ask kids about themselves. He would bend down and look little boys and girls straight in the eyes, so they knew he was fully focused on them. Then they poured their hearts out to him right on the spot. No, he wasn’t compensated for that time, and neither are we. Most popular bloggers spend inordinate amounts of time reading every comment, responding to every email, and watching what people say on Twitter. None of this has any direct effect on traffic, but what it does is build goodwill. One at a time, your subscribers find out that you really care, and it transforms them from readers into raving fans. Mr. Rogers didn’t pretend to be better than the children who watched his show. He didn’t point out how young and ignorant they were. He didn’t appoint himself as an expert and command them to listen. Instead, he decided to be their neighbor: someone just like them, who knew what they were going through, and was ready to help in any way he could, not because they were defenseless children, but because that’s what good neighbors do. The same is true for bloggers. If you really want your audience to listen to you, you need to take the time to tell them your story, pointing out the ways you’re similar to them and inspiring them through your example. Most kids are terrified, not just of getting caught with their hand in the cookie jar or their parents finding a bad grade on their report card, but of the possibility that they’ll do something so bad that their family will stop loving them. They believe that love is only for “good” children, and they worry that they don’t deserve it. This quote was Mr. Rogers’ gentle way of correcting (and comforting) them. Over and over again, he would tell them that, “I like you just the way you are,” not just because it sounded good, but because it was what they needed to hear. They needed to know that love wasn’t conditional, and that they were safe enough around him to make mistakes and learn how to improve. I believe it’s important for us to create the same environment for our readers. You may not realize it, but lots of your readers are probably intimidated by you, believing that they can never be as good as you are, and they’re afraid to reach out to you for help. It’s important to remind them that you like them just the way they are. Maybe you don’t have to tell them as often as Mr. Rogers, but take a moment every few weeks to mention how impressed you are with the creative ways they’ve implemented your suggestions and how are honored you are to have them as readers. It’s a small thing, but it matters. Every day, Mr. Rogers honed his craft, paying attention to even the smallest of details. One time, he asked a fellow actor to say “the dog is going back home” instead of “the dog is going back to his owner.” He didn’t like the word owner because it was too possessive for the children viewers. He also stuck with what worked. “Won’t you be my neighbor?” wasn’t just the theme song for the show; it was a way to set the tone at the beginning of every episode, getting children ready to listen. And so he repeated it, show after show for years. It’s our responsibility as bloggers to hone our craft in the same way. You should experiment, not just with headlines or post ideas, but with new openings, new closes, new pictures, and even new words. It’s how you improve. And at the same time, take a lesson from Fred Rogers and don’t be afraid to repeat what works. When will your opportunity be? Back in 1969, Nixon proposed cuts to PBS, leading the Senate to hold a hearing that would decide the future of the station. And who do you think appeared before them and melted their hearts with words? He wasn’t the CEO. He wasn’t a Washington insider. He wasn’t even well-known to the committee. Yet he showed up, spoke from the heart, and transformed some of the toughest, most hardened politicians in the country into raving fans. Watch this video, and think about it. Because when it comes, we’ll be counting on you. About the Author: Karl Staib writes about building stronger relationships and being happy at work: Work Happy Now! If you enjoyed this article, you may like to subscribe to his feed, follow him on Twitter, or read one of his most popular articles: How to Write a Career List. Karl Staib is the publisher of Domino Connection. Check out his free course "How to Create an Amazing Product Launch." You can also find Domino Connection on Facebook, where he shares all kinds of great content and tips. When I was a kid I thought Mr. Rogers was just too square to live, but now that I’m old and tired I think he’s completely fantastic. This blog gave me a happy feeling and made me want to write happy, helpful, confidence building things all day. Thanks for that. You’ve improved my morning! Wonderful – thank- you for the post and for sharing the video clip. I was struck by how heartfelt Mr. Rogers’ message was – and how straightforward. It had none of the frenetic energy, cleverness or sophistication I sometimes associate with modern day communications – yet it was so effective in its simplicity and so meaningful for its target audience. What a great lesson for us bloggers. Me too, Sonia. I’ve read where he didn’t even like television. The reason he started the show was because he saw the influence of television on children and wanted to do something positive. @Ami, I agree, that video really shows persuasive communication at its most powerful — without any hype or push, just really speaking gut to gut. I absolutely adored Mr. Rogers as a child. This post definitely gave me inspiration for my day. Yeee haaa! I’m on CopyBlogger. So very cool. Thank you for the great comments so far. Hi Jenny, Thanks for spreading Mr. Rogers’ message. Hi Sonia, As I grew older and more aware of what my friends thought of me, I was ashamed to admit that I liked Mr. Rogers. But I always watched him. Now I realize how important he was to my confidence. The American culture was so lucky to have him teaching our kids how valuable they truly are. Hi Beki, Mr. Rogers has that effect. Hi Ami, We need to learn to speak from our hearts and let the audience fall where they may. We can’t please everyone and we shouldn’t try. @Karl, I didn’t get TV until I was 6, so I think that’s probably why I never dug him. His approach works better for littler guys (even if they never quite outgrow him!). In fact, thanks for reminding me that I want to get some DVDs for my own Little Dude. It’s really sad that most of the blogs that I see in searching google these days are those “buy these buy that” and “do this do that” blogs instead of blogs like this. Bloggers should think more of transforming their readers into fans who learn a lot of good things from their blogs rather than converting more people into 1-stop readers just to get to the top spot in google search. This is good advice but useless for the heartless. I’m sorry, but you can’t TEACH people how to open up. I write from the heart every goddamn day. I laugh and bleed all over the keyboard and simply can’t do anything else. The key to “writing from the heart,” occasionally my own tagline, is brutal, scathing, total honesty. You can’t teach that either, you either have it or you don’t. I have it, and it’s a blessing and a curse. The ability to tell it like it is comes from *suffering,* basically, in my case being raised by terminally depressed mutant farm animals on crack. You could also call this karma, and you don’t want mine unless you’re certifiably insane. Sooner or later I’ll transmute this into gold, but not from trying to make money or buying into the how-to-be-a-rich-blogger industry hype. The only thing that matters is love, and it’s also all there really is. Thank you so much for reminding me of what is at the very heart of communication. Mr. Rodgers was one of my heros growing up. What a wonderful man the world lost with his death. We could do far, far worse than to emulate his directness and his integrity. What an excellent post this it. It reminds us to not only be human to our readers, but to “love” them… in order for them to want to be OUR neighbours. There are some great points in this post and it is so beautifully written. Have you included some Mr. Roger’s love in your post? Thanks for your wisdom Karl! Thank you for this delightful post. I am another of those who found an appreciation for Mr. Rogers later in life – loved the mushroom cave! This guide can be applied to all aspects of life. The world needs more gentle characters like Mr. Rogers. Thanks Karl — I’ve always known that to get people engaged about an issue they have to understand and care about it. Too often we rely on the logical and technical side to make our decisions. The heart shouldn’t rule the head, they need to partners. Its always good to give back to your readers. This doesn’t mean that it always has to be content or the latest news. It could be love! Im feeling the Mr. Rogers like love. Enjoyed the read! @John, that’s ok, the heartless aren’t our audience. 🙂 I do like to encourage the folks who put some real blood, sweat and tears into their stuff that they’re on the right track. @LJ, really nice, thank you. One thing I’d love people to take away from this is that Fred Rogers wasn’t just a nice person. He was hugely influential. He “sold” exactly what he wanted to sell, (ideas, in his case) without scamming or sleazing or hyping or bullying anyone. So it’s not just about being a good guy, it’s about being an effective good guy. I love this post and glad I found it. I love to blog but I also want to speak to people as if I am having a friendly conversation with the readers. I love to know that people want to visit my blog and thank you for giving me more to think about as I blog away…I would rather have blogging relationships than just followers who are not enthused to read what I have to say. I have kids now…NOW I understand! Wow, this was a great post! Mr Rodgers was always a favorite of mine. Thank you. Great post…Fred Rogers was a fine, fine example is a world where we don’t have very many. Hi Shane, It’s amazing how kids change our perspective. I too have a kid and like Sonia I’m going to buy some DVD’s for him. I want him to grow up with Mr. Rogers like I did. This is one of the best blogs I’ve ever read, punctuated by Mr Rogers honest, passionist sharing of what he thought, and his ability to communicate to Congress, a challenging audience, for what he stood for. His type of orator is rare in any era as his passion, love and desire to give seems to be what makes him tick. It’s a good reminder that passion really comes out at its strongest when you are giving, and it’s really all about the “other guy,” in Mr Rogers’ case, children and most specifically their ability to be in touch, deal with and accept that their feelings are OK, and that they’re way OK just the way they are. Thanks Karl and to you folks who have made some great comments already! Like many others, Mr. Rogers’ show didn’t click with me as a kid, or when my own kids watched it. Now that I’m older and a little wiser, I realise that not only was the man a genius, he was one of the most caring people to ever live and an example worth emulating in virtually ever aspect of life. Thanks, Karl. I needed this today. We need more Mr. Rogers in our lives. Making people feel loved, special, competent…not only is good for business, it’s good for the world. Nice post, thanks! Great post and analogy! I never thought about blogging/writing from that angle. Makes sense though, thanks. BTW, Mr. Rogers is the man! Thanks for the great post and the Fred Rogers treat, Karl. His voice takes me right back to 5 years old (without the orange crocheted afghan and grilled cheese). Mr. Rogers’ tone and delivery are so intertwined with his actual words, I wonder what we would make of them if we could only read them in print. I’m glad he got his $20M, or we may never have known. I think sometimes we writers also forget to be deliberate with our message, but to tread lightly and respectfully with our tools; words. I loved the beginning of the video clip where Rogers countered a flippant remark with sincerity and an earnest request to explain. He bought himself time and respect, something that’s difficult to come by these days, especially via a blogpost. You’ve succeeded in both with this post. Sheesh. I hadn’t watched the video, and just did. If you didn’t watch that video, take 6 minutes and learn some of the most powerful communication lessons ever taught. You’ve certainly melted my heart. And this gives me hope, because in a crowd of Blogs about blogs I really believe this is the area where my blog can stand out. I really do strive to make my readers feel loved and genuinely cared about. If that’s what does it, then look out World, I’m on my way to the top of the search page! @Joel, it’s pretty killer, isn’t it? Really takes my breath away. Mr. Rogers would be a helluva blogger if he were around today. The stories that guy could probably tell. What memories this brings back. I LOVED Mr. Rogers. That’s right, love bold all caps. I think it should be required viewing in kindergartens all over America. Happened by here today because of Chris Brogan. I will only add that one of my favorite memories of my now 29 year old son was that of him sitting on the couch, as a three year old, watching Mr. Rogers. When Mr Rogers would ask a question my little boy would answer them aloud! He felt a part of Mr. Rogers’ world. Won’t you be my neighbor? Karl, yesterday I was laughing (and learning) with Johnny B. Truant and today I’m reading your beautiful article; that touches somewhere deep within me and making me feel inexplicably weepy. Thank you Mr Rogers and thank you Karl, for helping us all to make this world a better place for all of us. Thank you so much for this article. I am a brand new baby blogger… not even sure I am allowed to be called a blogger yet. I feel excited but also overwhelmed, and your words really helped focus my energy. Truly, I am writing because there are so many wonderful people in my life that I love and want to help. But it’s easy to forget that. Thanks for the reminder. I remember watching Mr. Roger’s as a kid and absolutely adoring the show. Now that I’m older, I realize how great his message was. I wish more people were as genuine as he was. Being an Aussie I never saw anything about Mr Rogers until a few years ago, but I still feel as protected and nurtured by his compassion as I would have when I was three. What a wonderful man, and an excellent article. I’m very glad I told all my readers I loved them a couple weeks ago. Mr Rogers did a lot of good for the world, and you’re right, he walked his talk. He was the genuine article and he exuded kindness and pure caring. Thanks for reminding me of him today – if we each took a chapter from his book, we’d be a more content, loving, and secure society – we wouldn’t need to lean so hard on the hollowness of celebrity. I have a blog about been an expat living in the sun and on this i talk only about personal experiences from the heart only and the readers warm to this as they want your take on things. Like to see that the stuff that I really despised as a kid can be used practically. Congratulations and what an amazing article piece! That is so true, we as writers do tell a lot of how to be or live, or whatever advice we put out, but how are we living it out ourselves? 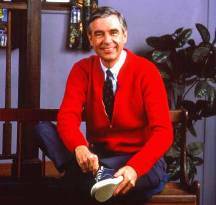 I love the advice of “be a neighbor” – even though I did not watch Mr. Rogers, your addition of how it all fits in here is brilliant! Libby, even if Mr Rogers had been an army sniper, snopes.com notwithstanding (thanks, Joel), he must have felt remorseful, like more than a few other killers before and since then, in which case the experience changed him – for the better. Karl’s post should be required reading (but of course it won’t be) for military people here, there and everywhere. Mr. Rogers is my hero. He never ceases to inspire me. Reading about him brings tears to my eyes, I think like Gordon Rowland wrote, it “touches somewhere deep within me and making me feel inexplicably weepy.” My daughter alerted me to your blog post. Thank you, Mari. And thank you, Karl. I’ve never heard of Mr. Rogers! But watching that video, I wish I had him growing up! What a great observation Karl! I loved this post – and LJCohen’s haiku! When I was in my teens in the 80s, people used to imitate Mr. Rogers’ voice and make rude jokes. “Can you say [insert rude word]? Sure. I knew you could.” And, even though it was funny, I felt terrible guilt for laughing at the expense of kind Mr. Rogers! Great article. Very informative. I wish my kids were watching the shows that I grew up on…Mr Rogers, Sesame Street and Romper Room instead of the current options!! What a feel good blog post. Thank you for the inspiration! Blogging is such a joy, and also a frustration sometimes. Your post reminds me why I love it so much. Excellent advice. I’ll put that into practice. I was more of a Soupy Sales fan. Mr. Rogers was even around when I was a kid. But my daughter loved him..called him Doo Rogers before she could really say his name. I agree we have to be good neighbors. Connect people with one another. Appreciate the friends, customers, readers, co workers, and give them some public love in your blog. It’s amazing how many lives Mr. Rogers touched. Just look at all the people who read CopyBlogger leaving comments and retweeting. We are all banded together sharing in each other’s memories. We can create blog posts that band people together. I love that Mari told Sydney that this blog post was online. It helped me remember when my mom told me that Mr. Rogers was on. It’s this sharing (word of mouth) that creates memories. It’s these ideas that spread and change the world into a better place. All of us bloggers can do this and it’s this gift we can’t take lightly. We need to share Mr. Rogers, Gandhi, Mother Teresa, and all kinds of amazing people with the rest of the world so these people live on forever. Well Done, Karl! Another guy after my own heart! (You AND Mr. Rogers.) Your article made me feel all warm and fuzzy inside and reminded me of the importance of making others feel loved and special. Thank You. I suffered 3 times with PostPartum Depression, and hearing Mr. Rogers tell me every single day that he liked me just the way I was, brought me back from the edge. As grownups, we rarely hear affirming words like these and definitely not on a regular basis. Thanks for reminding us all about Mr. Rogers and unconditional love. It is true that people are looking ffor connection and trust. And that goes for life and of course business is a part of life. Using your ideas for raising kids as well as creating business would be good. I really liked this article; it made me feel good. As a child, I remember wishing Mr. Rogers was my neighbor and we could visit from time to time. I think Mr. Rogers would be proud of you and how you portrayed him and perpetuated his message. Thank you. Sydney, thanks for sharing what I wrote, and thank you Karl. I was raised in England (now settled in NSW Australia). I’d never even heard of Mr Rogers till the other day, but I’ll certainly never forget him. The way you described being you readers neighbor really resonated with me. In the vastness of the internet most would appreciate a little neighborly love! Thank you for the brilliant post! I am just re-reading this post and all the comments. What caught my attention selfishly was the words in the title, “blogging from my heart”. Late last year I lost my Dad, and travel too much to give consistent support to my community, so my way of giving was to start a blog in his honor as he was a giving, loving, warm man with an incredible enthusiasm for life. My blog is http://blogfromtheheart.com. I would love to hear from like minded people, and to list your blog address on mine in a cooperative effort to share about caring, love, passion and dealing with our feelings. Well, that was refreshing! Thank you so much. I am trying to figure out how I can relate these warm fussy feeling when visitors come to my website. Although I will never be “mr. rogers”, I would like to convey trust and caring throughout, I’m not sure how to do that. If anyone has ideas, please let me know; I’m very open to suggestions. This was a great post…in this electronic world we live in there is more of a chance than ever to reach out and make someone feel special. When customers send me e-mails, I always make sure to respond to them by name–its amazing that this one thing, I have been told, makes them feel like they are dealing with a person who cares. I do care. I care more about people than my business and the fact that this “pays off” is a great bonus. This was a wonderful post. Thank you. Deborah, much of conveying that warm fuzzy feeling is just being yourself, even when you write online. Just a quick glance at your site (linked from your name) shows something fun, and the text is fairly friendly and human, but there’s a lot that could be done to make the whole site more warm and fuzzy. If you’d like to chat about it, I’d love to offer some free advice (I promise faithfully not to try to sell you anything.) My name is a link to my website. Give me a shout there if you’d like some focused advice which might help. In the two months I have been following this blog I have to say this is the best post I have read yet. I try to blog this way so your post reasonates with me in significant way. I have to say, Fred Rogers may just be the best example of the “evangelical sales person” I have ever seen. Why is that? Because when the senator said “You got the $20M” he stopped talking. Sale closed. What a total pro. Your a genius, Karl. Nice work. Mr. Rogers did make me feel special and I your point on how Copyblogger made you feel smarter. My first visit to Copyblogger and it’s already bookmarked. Being a Brit, this is the first I’ve heard of Mister Rogers. What a character that man was! Such an engaging and endearing aura about him – I will certainly be finding out a bit more about him. Great post too – it’s given me some important things to think about. Anyone who wants to really build a large and loyal readership online through blogging would likely want to read this post. In fact, using the mr. Rogers here as an example, it actually drive the point home quickly on how one should go about connecting with his/her readers. As you may have know, some of us “talk at” our reader instead of us “talking or speaking with” them, asking them how they are doing. If we ask them how they are doing and make them feel good every time they are reading our blog, chances are, we would always win them over most of the time. As a result of that, this post is a most read for everyone who wants to build a long time relationship with their readers. I love this post…keep it up. Thanks for sharing that video Karl. Wow, that was a great example of the power of speaking from the heart. I remember Mr. Rogers years ago when I lived in USA. He was poked fun at a bit for his old fashioned values but I always liked him. He sure melted that old judge. I’m moved to tears by this post and isnpired at so many levels. But I think I am mostly inspired to fulfill my personal goals while putting others at the center. Absolutely amazing post. This is such a different site!! I grew up in Pittsburgh where this show was filmed for so long. Watching this man deliver his heartfelt message I have to say I think I’m the better for it. Sometimes being able to have friends on the TV was all I had. Nowadays this is even more the case. Fred Rogers was unassuming. The message was the star and he never tried to take away from that. I think we could all learn from his form of communication as mentioned in your post. Well done, this brought back very nice memories. Wow, that video really conveys Mr. Rogers’ passion. I can remember watching that, or maybe re-runs, show. I’d like to think that time was well spent childhood time. Haha, even if it is corny, I think that link and this post was a great selling point for passion and content. Another great post by CopyBlogger. Mr. Rogers deserves an applause for his enduring concern to children. As a mother, I can relate to his views. For implying to everyone that a child needs more attention, more love, more care to be understood. That children are worth of all the goodness that we adult should take part to them. Thanks for sharing this video, worth to watch.. I grew to have a deep respect and love for Mr. Rogers after I had children. His calm and balanced approach and his utter acceptance (how many children truly experience unconditional love?) were unique in their day – and to this day. Thank you for a wonderful post. I endeavor always, through my blog & newsletter, to both empathize with the head of a 1-person nonprofit development shop – it can be such a thoroughly unappreciated job – and to provide solutions. Awesome tips especially the tips about “Seize the Opportunity” I have really liked. Thanks for such useful tips on blogging. I really appreciate them. The same things I had read on datadubai.com but this your article is much more comprehensive and a bit more detailed. This was an awesome guest post! It’s very refreshing to hear this point of view. I love the idea that beyond the content, beyond the design, beyond the navigation the fundamental purpose and objective of blogging is really about building relationships. Thank you for the reminder. Great post, Karl – a real breath of fresh air. I especially resonated with what you said about creating an environment where it’s OK to be imperfect, and avoiding sounding like self-appointed experts talking down to folk; it’s important to get the balance between sharing your insights and passion and preaching. Lots of us like niche sites where we feel we can contribute to a community and not just be preached at. This is something that I constantly wrestle with on my site. How much to teach and how much to share stories. I currently like to mix it up, since I am naturally an information-giving type of person, but I have found that every time I tell a lesson with a story attached to it, there is much more response. People immediately remember stories, because that is the way we think, in pictures. If you can put a life or business lesson almost in the form of a fable, you will have much more sticking power than you will if you just tell people what to do. …now if I can just listen to my own medicine. Where’s Mr. McFeeley when you need him? About two months before the accident that broke his neck, Christopher Reeve testified at a Congressional hearing on NEA funding. (March, 1995) I was lucky enough to be in the room and sitting a couple of rows behind him. The clip of Mr. Rogers reminded me of that. We all need a Mr. Rogers in our life – or a Christopher Reeve – to show us the way. To make us see the importance of things. It’s one of the reasons I like folks like you, Chris Brogan and others. In many ways, in this new medium, you are showing us the way. There is so much I can say about this blog…but all I want to say is thank you. This is exactly how I feel as well. I am so pleased that Mr Rogers was also the Rev. Fred Rogers and a colleague in ministry in the Presbyterian Church USA. Thank G-d, for Mr Rogers! Thanks so much for this post. It is true that people want to know that you care about them and whatever their problem is. Building relationships is so important, in life and business. I signed up to be notified when more comments were posted and my in-box is full of wonderful comments about this blog post and about Mr. Rogers. I’d like to share my favorite biography of Mr. Rogers, for anyone who is interested: The Simple Faith of Mr. Rogers: Spiritual Insights from the World’s Most Beloved Neighbor. It is out of print but Amazon has it for sale and it is available at many libraries. There are other good books about him and by him that you would enjoy if you were touched by this blog post. I’m loving being a part of this neighborhood. Nothing else to add here but Thank You. Yes. Awesome. Mister Rogers has ALWAYS been my hero!! If more people would aspire to be like him, oh what an amazing neighborhood we would all live in!! Prayers of thanks for blessing our world with this kind soul! !